Enrique Lafuente Ferrari (1898–1985) belonged to the second generation of Spanish art historians and always considered himself a disciple of Elías Tormo and Manuel Gómez-Moreno, although it was probably the philosopher José Ortega y Gasset who had the most lasting influence on his work. Of the many interests that engaged his attention during his prolific career, two stand out particularly intensely: Diego Velázquez and Francisco de Goya. He is responsible for some of the most brilliant pages ever written about the life and work of the Sevillian painter in five monographs and numerous articles published in specialist journals and periodical press, as well as other texts included in comprehensive reflections on Spanish painting of the seventeenth century. 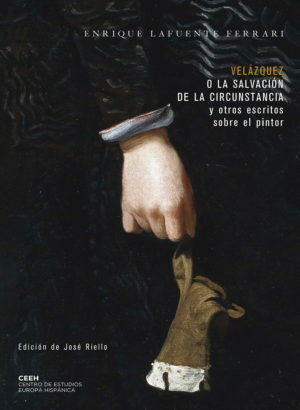 This book compiles more than twenty essays in which Lafuente Ferrari explains his conception of Velázquez’s painting in a straightforward, lively style that conveys his ideas with an unusual clarity which, coupled with the sagacity of his thoughts, makes him one of the most outstanding art historians; indeed, Fred Licht hailed him as ‘the doyen’ of Art History in Spain.